London Women's Cycle Racing: One Week, Two Rounds and a Lot of Tired Faces! One Week, Two Rounds and a Lot of Tired Faces! It's that time of year when races are coming in thick and fast, and it was as such that the London League had two rounds within a one-week period. The first one at Crystal Palace saw a very hotly contested race with a blistering pace being set by Elise Sherwell (Pearson Cycles), Joanne McCrae (VCL) and Corrine Hall (Team Corridori). This immediately led to the bunch splitting into smaller groups. At the front end of proceedings Maryka Sennema (Kingston Wheelers), Claire Beaumont (Rapha Condor) and Leona Kadir (Sigma Sport) also joined in the fray. Further back in the field mini battles took place between Vikki Filsell (Pearson Cycles), Dyanne Holland (Dulwich Paragon) and Wiesia Kuczaj (Twickenham CC). Sadly Elise retired from the race with cramp, while more seriously Leona crashed heavily on the hairpin and was taken to hospital with a broken collar bone. As a result of the crash the circuit was shortened to an up and down stretch on the side of the hill, which made the riding even more energy sapping. Then in the closing stage of the race Corrine made launched a hard attack on the hill and broke away from the front group, to finish victorious over rivals with a 40 second lead. Maryka and Claire sprinted it out for second, with the league leader managing to edge out the Rapha Condor rider to third place. Joanne rolled in shortly afterwards in fourth place. 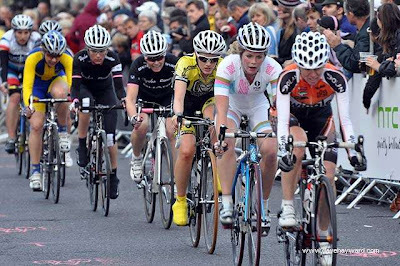 On a pleasant Saturday evening in the City of London the women's race took place as part of the programme of events for the Smithfield Nocturne. Around 30 women took the start of what would be a very fast and furious race. Many of the women were able to put their speed and skill to the test on this twisty short circuit around the old market. 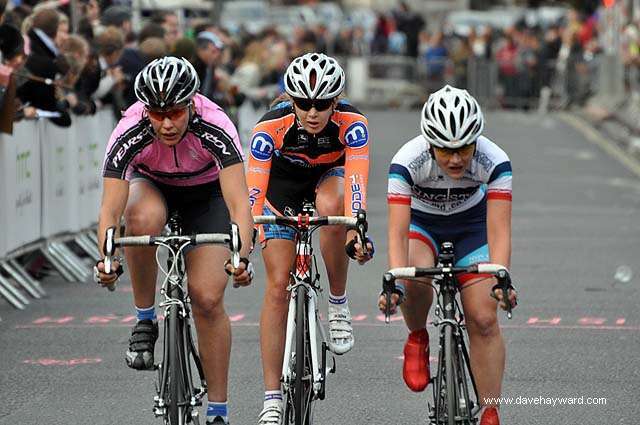 Many of the women would have been well primed for this, having raced at Crystal Palace many times. From the gun the pace was fast and girls were losing the front group even on the first lap. The pace was being kept high care of Nicola Juniper (Ciclos Uno) and Corrine Hall (Team Corridori). Although they managed to shake off a number of riders including league leader Maryka Sennema (Kingston Wheelers)and other strong local riders, they couldn't lose the likes of Louise Mahe (Team Mulebar Girls) or Claire Beaumont (Rapha Condor). Meanwhile mini gruppettos formed around the circuit, including one that contained Maryka Sennenma and Elise Sherwell (Pearson Cycles) and another that contained Sabine Homrighausen (Kingston Wheelers), Astrid Wingler (London Phoenix) and Vikki Filsell (Pearsons Cycles). Watching the women's race was a real crowd pleaser and spectators watched in awe as the women flew around the course for more than half an hour. As the race progressed the toughness of the race and the toll it was taking on the racers was clearly evident. Girls just clung on for dear life with either a grimace of pain on their faces or mouths just hanging open as they stared blankly while focusing on chasing the wheel in front. 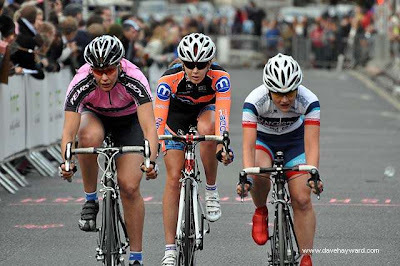 In the end the race was won by Hannah Barnes (Motorpoint-Marshalls Pasta). The highest placed league finisher was Louise Mahe (Team Mulebar Girls) who finished in fourth place. Maryka Sennema still keeps the league leader's jersey, though a number of contenders are steadily creeping up to take her top spot. Victory for Beaumont as Sennema Toughs it Out!